Last Saturday I took myself over to Spitalfields for the We ❤ Asian Food Festival. Now, before I go on, a word about food festivals – in general, I think they are pointless. They’re usually overpriced and repetitive. 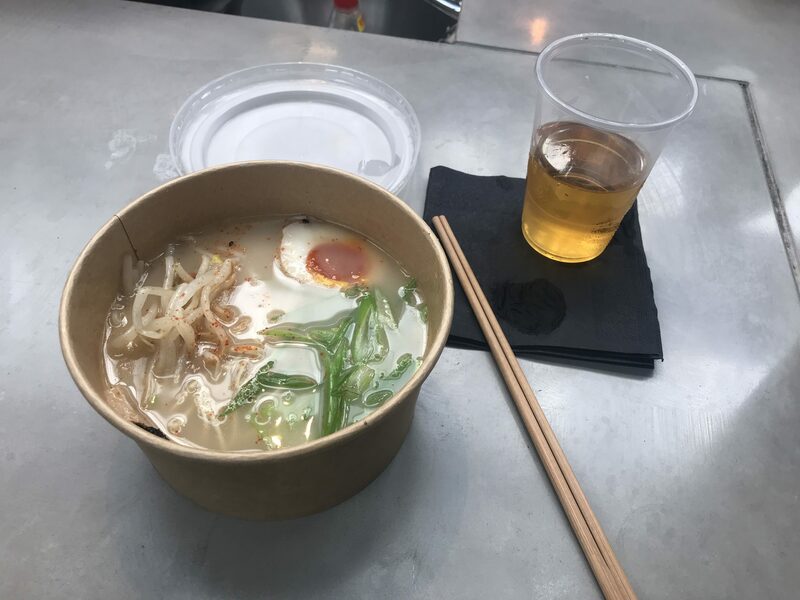 However, at just £5 for a ticket which included a free drink, it seemed like a no-brainer, and the advert I saw mentioned there were ramen vendors! Say no more! I did a full lap of the venue and didn’t see a single ramen stall. My stress levels were mounting. But then, I spied a lady slurping on noodles from a box. There were ramen here somewhere, I just needed to find them! Another lap and a half later I found Thousand Knives hidden behind a queue for a bao stall. Apparently, they have a fully fledged restaurant in Dalston, so that’s another one added to the to-eat list! The menu options were limited, but this is essentially street food/take out noodles, so I didn’t mind too much. I went for the signature pork ramen just as it comes, and was not disappointed. In fact, the quality of take out ramen consistently surprises me – the noodles were firm, the egg was soft (although a little cold). The spring onions could have been sliced thinner and ideally, there would have been another slice of pork. However, for £8, this is some of the cheapest ramen I’ve had in the UK. I give them a solid RAMEN (3 out of 5), which for noodles in a cardboard box is actually pretty damn good!